we just got back from gujarat the other day. this year, just like last, we ended up with a few free days, and the only unexplored destinations in the vicinity was in that "dry" state next door. last april, we headed to diu. 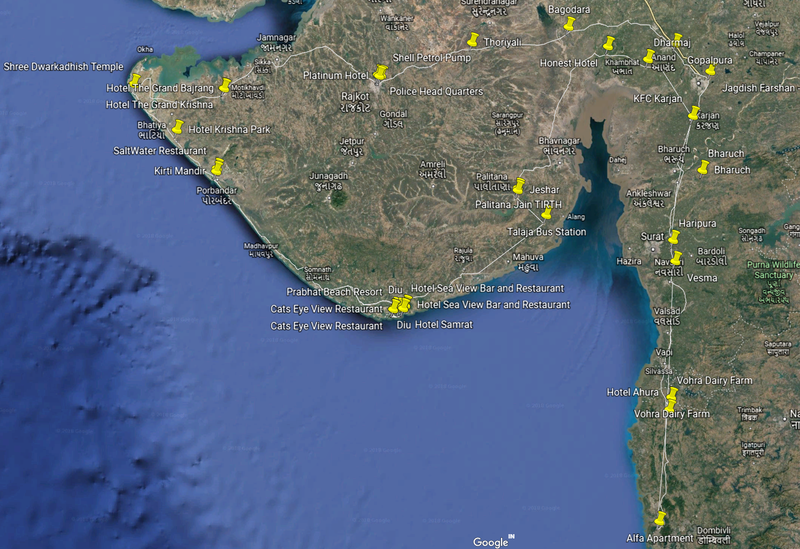 it was a nice place, we had a lot of fun, but we didn't see anything around (ie outside) diu or elsewhere in the state. this may, we set off from home intending to see a couple of places around diu while keeping it our base, but ended up riding quite a way off course as well. i think gujarat in summer can be most appropriately described in two words: intolerably hot. yes, most people would assign the same adjective to most of india, but with temperatures peaking over 45 degrees c, and staying over 40 for at least 5 hours daily, this part of india deserves it the most. and so, riding in these temperatures has taught us quite a bit: visor down all the time, wear light layers that let air pass through, rehydrate generously (we'd easily down half a litre of water each, at each break), and generously douse ourselves with water to cool down. still, most days would end with a mild headache by sunset, and that seems unavoidable. mornings are pleasant though, and until 10:30 am or so, it'd be hard to believe that the same place we were riding though would turn unto a furnace very soon. it also helps not committing yourself to large distances, so that afternoon breaks can be longer and more closer spaced - i've done 800 km on one day, but 300 - 400 seems to be most achievable. the other things to be aware of are: road conditions, rest stops, and driver aggression/idiosyncrasies. gujarat, by virtue of being largely flat, is crisscrossed by networks of highways (national and state) - mostly straight, always flat, and dotted with intermittent villages. i did not encounter a single ghat in the entire week of riding (2200+ km!). the advantage and disadvantage of this feature, is that there are multiple routes between any given places, and no obviously better route. distances can be deceptive, as a route 10km longer may have marginally better roads and less speed breakers, and thus end up being far better. also, national highways are not clearly marked on road signs - you may find that a short stretch of narrow village road may take you from an frustratingly-potholed state highway to a smooth-as-butter-with-the-occasional-village national highway - but nothing on the road will tell you that. in fact, google maps' route determining abilities have proven to be woefully inadequate every single time: there have been times when it has chosen a worse route that (according to its own statistics) would even take more time, just to save a few extra km! what i've found, is before setting off, one should look at all the national highways between the start and end point, and try to connect them with as short stretches of state highway/village roads as possible, note down the towns/villages at such connecting points, and use those for navigation. last year, for example, we had such a terrible experience riding to diu (blindly following google maps' navigation), that we were dreading the ride back. however, we ignored the navigation prompts and stayed on the national highway we found ourselves on, and actually had a smooth ride back, which was much faster and very comfortable too! the other thing to be wary of, is rest stops. the mumbai-delhi highway is peppered with restaurants and food courts, which are reasonably comfortable and good for riders. however, other national highways have few, if any, such stops, and most are likely to be in a state of disrepair - we were happy to find a place to sit with a ceiling fan and a washroom of questionable cleanliness - air conditioning and clean washrooms simply did not exist. the food is also barely passable, and you mostly have to survive on packaged junk and tea if you are not particularly fond of gujarati food (which i also find to be nap inducing!). non-veg (or even egg) is simply out of the question. and these are the national highways. state highways have nothing more than tea and sugarcane stalls. let alone finding a fan, a bench to sit on with a roof over your head would be about the best you can expect - we have had stops where we had to choose between shade and a seat. the people are nice though, like one guy who charged us just 10 rs for a glass of sugarcane juice and 3 glasses of lemon juice - he said the lemon juice was free as "i can't charge you for water"! many of the petrol pumps do not have shade, which is insane considering the weather. everyone has huge vats of water though, which you can judiciously pour over yourself to cool down. and finally, driver idiosyncrasies: people seem to hate driving at night, so there's a great increase in aggression just before sunset as everyone wants to get to their destination before dark. by 8pm (barely half an hour after sunset), the roads are largely deserted. i've found the aggression starts around 5pm, and peaks just before sunset. it's a rather hair raising time to ride, as innumerable incidents of being run off the highways by large oncoming speeding vehicles have shown, but sadly, it's also a good stretch to complete distances as the heat is somewhat bearable and sunlight helps dodge potholes, speed bumps, etc. bonus tip: be prepared for crosswinds. i'm not sure if it was just the time of year, but the crosswinds have been extremely strong for majority of the ride! i'm sure less experienced riders would have a tough time at mile-munching speeds, as i've done hundreds of km with a constant pressure trying to blow me in one direction or the other. ps: be prepared for a lot of curiosity from people if you're fully geared up: most villagers, having never worn or even owned a helmet, look at you as some sort of alien!